My baby boy turned 7 yesterday!!! I can not believe how time flies!! My daughter will be 14 on the 28th and then I will be 33 on the 23rd . . eeek! So April is a busy and expensive month around my house! LOL Anyway, John had a great day yesterday. He will have a party to invite friends on Saturday but he got his presents from family yesterday! We got him a new bike! He loves to ride his bike, he loves the outdoors. When he came in from school it was sitting in the living room but when we were walking up he seen presents sitting on the table through the window so he did not even notice that bright green bike! LOL When he did notice it, he was so excited and started jumping around. This bike has the front and back breaks. My husband explained that if he only used the front brake it would cause him to flip. Well I don't think that he believed daddy! He was going really fast and what does he do . . . he uses just the front brake! (He had to try it, right?) Next thing you know he has handle bars jabbing his tummy and has a pretty bad scraped up elbow! But he is fine now and now he knows that daddy was not telling him a lie! 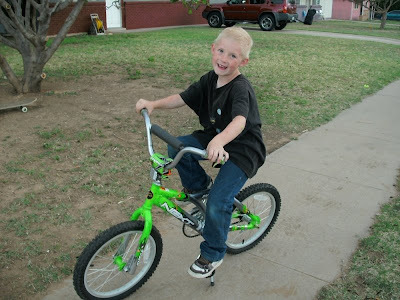 LOL Anyway, here is a pic of my handsome little man on his new bike! He is so funny when you tell him to smile he makes crazy faces that you can tell are forced smiles! 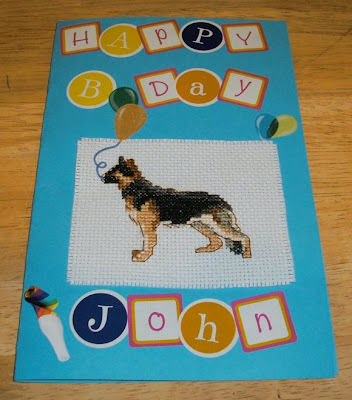 LOL Anyway, I let him pick what he wanted stitched for his birthday card, so here is the card that I made him. I have started on "Wedding Spots" for my brother and new bride but have not had a chance to take a progress pic, so I will show that next time! My dad told me that I had some money to spend on stitching goodies for my birthday so off to ebay I went! I found a great ebay store with a ton of great 18 ct Aida for a great price. So, I am looking forward to receiving that! Don't forget to check out the new blog that I made. This blog is for an ATC birthday exchange group that will last 1 year. If you would like to sign up, please do! The more that better. If you are not sure what an ATC is then you can find a like on the left of this blog or on the right of the new blog to give you an idea. I also have a few example pics on the new blog as well! So make sure and check it out and sign up!!! ATC's are a lot of fun to make and they are also very quick to make! I would like to thank everyone for the comments on the stitching of my daughters design! I would also like to thank you all for the wonderful comments for my dad and step-mom for loosing their dog, Tazy. They are doing better now but miss her like crazy! I have not been very good about responding to everyone's comments but please know that I really appreciate every single one that I get and you all mean so much to me!!!! Well, that is about it for now!!! what an adorable smile!! even if it is forced! He is adorable!! I miss my 'little boys'. His card is adorable! Great job mom!!! The card and the pic of John on his new bike are cute. Happy birthday to John..from Malaysia.. I remember I did and then I couldn't ride my shiny new bike for 4 weeks while I healed! Agh memories. Cute card and Happy birthday to your son! Sounds like you made your Son's day! Great picture - isn't it fantastic when you get your children something they're so excited about? Sounds like a great day. Love the card! 14 Years Old - EEEEeeeeeek! New Blog - New Exchange!! !